Casper the friendly ghost, the friendliest ghost you know. Casper and his friends Wendy the Good Little Witch and Hot Stuff the Little Devil are back! The lovable Harvey classic returns to comics to delight kids of all ages with brand new adventures in the original beloved style. Generations of todays artists grew up on these wonderful characters and now they have an opportunity to contribute colorful new stories to their legacy. 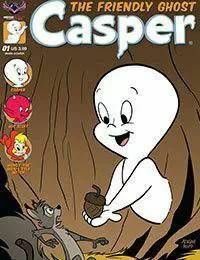 This fun first issue features three new exciting Casper stories with his friends Wendy and Hot Stuff! Join us on Caspers journey with Main Cover by Adrian Ropp, Spooky Variant by Mike Wolfer, Classics Cover by Bill Galvan, a Blank Sketch Cover, and a special Retro Animation retailer incentive cover!